Summer is filled with highly anticipated superhero movie releases. While superhero epics seem like the Greek mythology of our time, with towering men and women possessing deity-like capabilities to save the world, there is something human in their approach that we as social sector warriors can borrow in our change management efforts. Whether we are trying to pivot to a new strategic plan or move to a more collaborative model within a community (see Collaboration Commandments), change is hard. While it sometimes feels like we need superhero strength to weather change, we mortals are resilient and can thrive by channeling our inner superheroes into a step-by-step process to change. 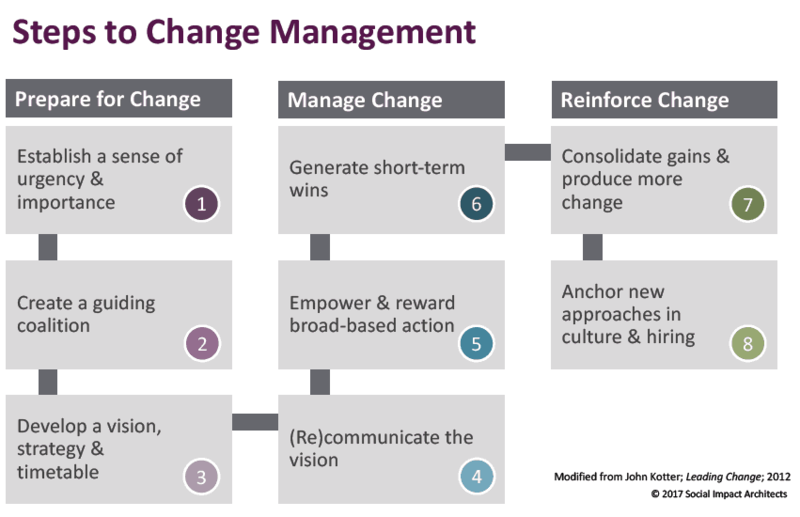 We are big fans of John Kotter’s book, Leading Change, which breaks the seemingly colossal goal of change into actionable tasks that, with effort and planning, can be implemented in social sector organizations. His roadmap to change, as outlined in the graphic above, incorporates many of the best practices we share with our clients. The truth is everything has some element of change involved and these steps can be helpful reminders. True for superheroes and social sector warriors alike, we need to gear up for changes in our organizations. In preparing our teams for tough sacrifices and new ways of working, we need to create a sense of urgency around why change is needed. Whether you are Iron Man demonstrating the threat of weapons in enemy hands or a nonprofit CEO facing regularly declining financials or the threat of irrelevancy in the market, social sector leaders need to show their teams that the threats are real and shed light on the real consequences of inaction. After a credible threat has been acknowledged, leaders should build a team of like-minded champions to lead the charge and develop a well-defined vision and strategy for a thriving future. The biggest mistake that social sector leaders make is underestimating the role that complacency has as an enemy of social change. They make assumptions that because they understand that change needs to happen, that all others understand it in the same way. Or, they don’t prepare for an inevitable backslide once change begins to take hold, but barriers to change emerge. To mitigate this, we encourage clients to be a “broken record” – repeat and repeat until a new way of working is heard multiple times in multiple ways. By preparing for change, you are much more likely to build an army of support and have a shared vision and action plan that will help you weather inevitable barriers. For any change effort to succeed, social sector leaders need to be fearless in spreading their vision of the future, empowering employees to take action and building momentum for success through short-term wins. In this step, you must often turn over the vision and trust employees to lead the charge. My favorite example of this is the YouTube video called First Follower. It will change the way you think about leadership and will be the best 3 minutes of your day today. In order to change an organization, your employees need to have a clear picture of the steps they need to take and systems (including budget support) within the organization to support their action. As Malcolm Gladwell has said, “If you want to bring a fundamental change in people’s belief and behavior …you need to create a community around them, where those new beliefs can be practiced, expressed and nurtured.” For example, if silos or bureaucracy need to be broken in order to facilitate quick communication and decision-making, leaders need to change those systems to equip their staff. The biggest mistake that social sector leaders make is losing momentum during this phase. To mitigate this, consider benchmarking progress along the way. Celebrate successes and ensure that employees do not become disillusioned when all the hard work and sacrifice seem to be going nowhere. We are big believers in setting up success through short-term wins – research shows that a series of short-term wins leads to a higher rate of sustained success. By communicating how the new changes create those wins and recognizing those who help in the effort, leadership builds momentum for even more change. The last phase of the change effort is to infiltrate your organization by anchoring key values and behaviors into the culture. Superheroes like Wonder Woman do this by keeping the company of those who share the vision of peace and expelling those who don’t. For social sector leaders, infiltration means bringing on staff who share the vision for the future, taking on new projects that further support the change effort and increasing participation to more staff. By engaging employees in the process and creating a cohesive culture, leaders can further their change effort. The biggest mistake that social sector leaders make is not integrating this change into the organization’s culture and using it as a litmus test for future hiring and promotions. To mitigate this, consider updating your values to include the change or setting an annual goal to reinforce the change as a long-term goal. By building in expectations about employees’ behavior into the fabric of the organization, change begins to perpetuate and sustain itself. Change is tough for the social sector, but when leaders take heroic steps to call everyone to action it is manageable and achievable. And, when you hear employees and community stakeholders talking about the change to outsiders as the new norm, or even better, as their idea, you will know you have won the battle. We invite you to share your experiences with change and any successful battle plans for making it happen.